Whether you're trying to lose weight for summer; get fit to look as best as you can in your bride's dress (and even groom's suit) for the upcoming wedding; or you just want to enhance your overall health by shedding some excess weight from your body, you can lose weight naturally by including some essential foods like apples, bananas and cherries in your diet. 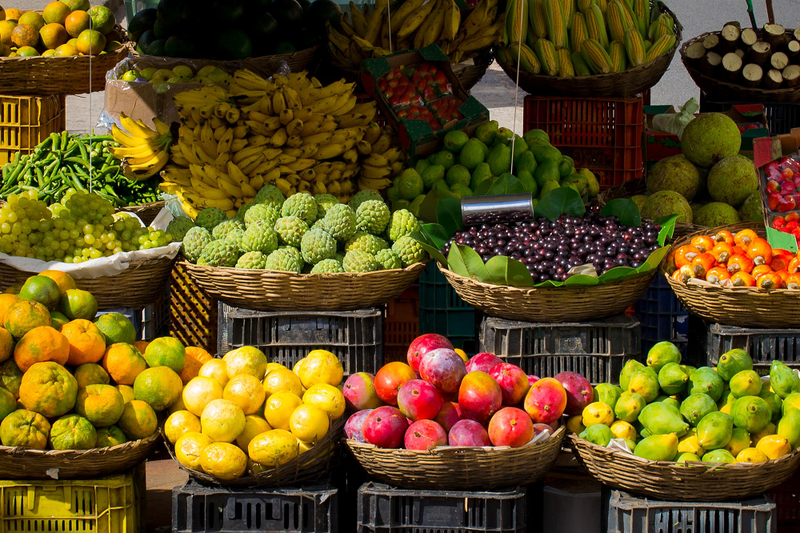 And, you won't have to break your bank or look too hard as apples, bananas and cherries are rather inexpensive to buy and all three fruits can usually be found year round at your nearby grocery store, local farmer's market stands or street-side fruit vendors. As mentioned in a previous weight loss article about juicy red delicious apples, An apple a day keeps the (bariatrics) doctor away, apples contain some anti-obesity phytochemicals (anthocyanins and malvidin, a anthocyanidin) as well as a polyscaccaride (pectin) that provides a soluble fiber to keep your digestion strong and steady while also collecting and flushing toxins from your colon like mold, yeast, viruses and even bacterial colonies such as E. coli and C. difficile. As you shop for apples to lose weight with, buy the apples that are more red-skinned as they are known to have more of the weight loss and/or anti-obesity phytochemical plant pigments. Chock-full of fiber, pulp and water with some (antioxidant and vitamin filled) fruit sugar along with notable minerals like potassium, boron, copper, selenium, molybdenum and manganese, bananas are a true powerhouse fast food that offer a wide array of health benefits for us as humans. With regards to weight loss (and even weight gain), bananas help us to keep our hunger cravings satisfied with their phytochemical makeup while they support and safeguard our digestive system. In terms of dietary nutrition and our ability to absorb the fruit's nutrients, bananas are best to be eaten when they are ripe, exhibiting a yellow color (and some brown spots) all throughout. As you or may not already know, cherries are a great sleep aid (bananas are, too!!) and, they play just as great of an aid for us with our weight loss goals. Acting as both a suppressant and a stimulant to our appetite, the sweet or even tart taste of cherries can help us to keep our eating patterns and meal portions in check. Furthermore, cherries act to detoxify our bodies so well that we really only need them in small doses or else we may get an upset tummy or experience loose bowel movements so practice moderation with your cherries by popping just a few at a time (*on a side note: perhaps the mental capacity and discipline required to limit our cherry consumption also serves to build our will power and determination all the more for losing weight). When looking for cherries, the darker the cherry, the better to eat. Now you know your ABC's so, what else can you do? In addition to beginning to supplement some fresh apple, banana and cherry fruits in to your daily diet, you can also utilize various other natural foods to help boost your health and speed up your weight loss. Depending on your set preferences and tastes for foods in general, the options are truly yours to choose from once you know what is (and what is not) good to eat for your body. While you can just eat good foods to drive weight loss and an increase in your overall health and wellness, you can also implement a rather regular fitness routine to provide the finishing touches necessary for you to truly achieve your health goals. Learn what specific foods are best for you to eat and what sort of fitness routine you can use to naturally lose as much weight as possible for your body. Got it, your test has been submitted and I will personally follow up with you shortly so we can discuss what foods and fitness routine will be best for you. Thank you kindly, I look forward to speaking with you and helping you with your weight loss and health goals. "This is for everyone who knows what it’s like to struggle with weight loss, heartburn, back pains, skin care, sleep and even mood swings."